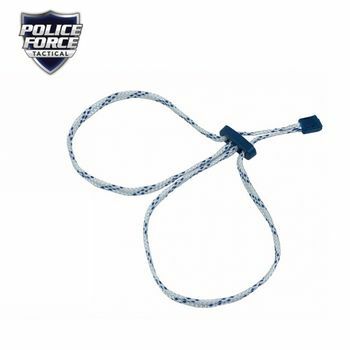 Although designed for police and security professionals, the compact size and low cost of the Police Force Single Use Quick Cuffs makes it easy for civilians to keep with them to restrain an attacker who has been immobilized by either a stun gun or pepper spray. Unlike traditional single use plastic cuffs, you do not need to be concerned about the cuffs cutting into the suspects wrists. The cord forms two loops and will restrain an individual with just one simple move. Can also secure a suspect to the rail of a stretcher in an ambulance for safer transportation to the hospital.